The Wil Wheaton web show Tabletop has proven to be a great medium for discovering new games and getting a better feel for what a game might be like before buying it. Of course not every game featured on the show immediately seems great. I remember that I wasn't particularly impressed with Shadows Over Camelot the first time around, but perhaps my initial hesitation related to the game had more to do with the players involved in that video. Now in terms of King of Tokyo, I wasn't entirely sure if this was a game that I wanted to get into even after watching the video. The concept behind the game seemed exciting since who doesn't want to control giant kaiju. However the actual system and manner of play felt a little underwhelming And when we finally got to try the game out over at Puzzles Board Game Cafe (I need to remember to write a blog post about this place soon) and that kind of cemented our decision not to get a copy of our own. It's not quite a bad game, but it isn't one that I think particularly fits our gaming groups. King of Tokyo is competitive board game created by Richard Garfield, the same guy who created a little card game known as Magic: the Gathering. The base set supports 2-6 players. 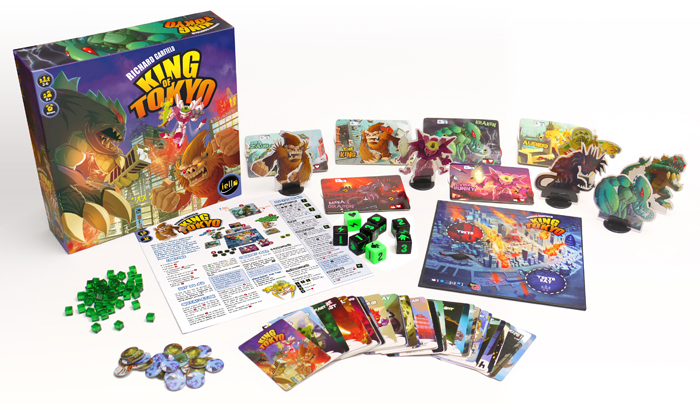 In the game, players each select a different kaiju-style giant monster (such as Cyber Bunny, Giga Zaur, or The King) and seek to become the King of Tokyo. There is not system different between the different characters but at least each comes with a custom scoreboard and a little cardboard standee with your monster. The goal is to gather 20 victory points, and there are a number of ways one can go about this. The game centers around dice rolls - there are 6 in total and a player may choose to re-roll all dice or some of them in order to get combinations that favor the player. Dice provide Life, Energy, Attack power or outright Victory points by getting triads of a particular number (ranging from 1-3 points). Energy is used buy power cards that can help your monster win battles. Hearts can heal you until a certain point. And of course attack power allows you to do damage to other monsters. The big action really takes place once a player first rolls an attack die, which in turn forces him to enter Tokyo. Managing to hold onto Tokyo provides 1 victory point when you first claim the city and 2 victory points for every turn that you begin in Tokyo. When a monster in Tokyo rolls Attack dice, the monster will do damage to all other monsters. However for all other monsters, any Attack dice only damage the King of Tokyo. And last, the monster in Tokyo is unable to regain life through Life dice. So it feels kind of weird how the gameplay is severely limited in relation to Tokyo. You'd think that the game could have factored in the option to cause damage to Tokyo or something, but I suppose that would make the game too much like Rampage / Terror in Meeple City. And the limited manner in which monsters can engage one another (only through Tokyo) sort of stalls some gameplay possibilities, in my opinion, since we're all just queuing for Tokyo. In the game that I played, I think the first 3-5 turns were spent with no one in Tokyo as we all re-rolled our Attack dice as we built up energy and tried to gather enough resources for Power Cards. The fact that characters themselves have no distinct abilities and rely solely on power cards was another let-down. The dice-rolling mechanic is decent enough, but the fact that it makes no real difference who you choose is pretty disappointing. At the very least, the art and the little standees are pretty cute. And the dice are pretty awesome, although a bit bigger than can be comfortably rolled using one hand. Too much power seems to lie with the power cards and realistically you'll only get to see a handful of these cards in a game, especially if a guy gets lucky with what power card he picks up early on so he can blitz Tokyo. There are some good ideas with the cards, but a lot of them are lost pretty easily despite the initial energy investment. King of Tokyo is an okay game with a lot of good ideas but some nuances to implementation that didn't sit well with me. I can see other people enjoying it, but I'm not quite there yet in terms of saying that it's a game I'd miss playing any time soon. Thus the game only rates 3 miscellaneous power cards out of a possible 5.